I must confess I have been keenly waiting for the next Wole Soyinka “moment” no matter how long it would take and it has arrived much earlier than expected under terms that most would not have easily imagined. No one said “the man” was not a genuine enigma. Soyinka has clearly stated that he will not vote for President Goodluck Jonathan (of the People’s Democratic Party) in the 2015 elections just around the corner and advocates that no right thinking Nigerian should vote the incumbent in for another term. 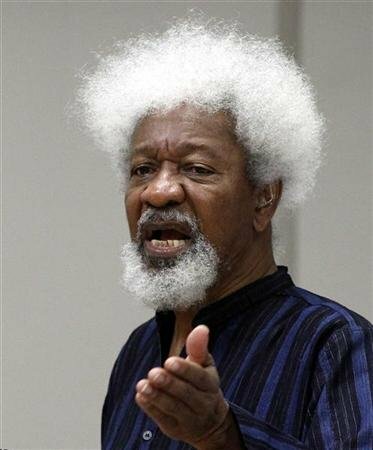 By implication Soyinka is either advocating that Nigerians should either vote for Muhammadu Buhari (of All Progressives Congress) or to vote for himself (of The Democratic Front for a People’s Federation) but he has not made it clear enough, it is all indirect and left to our imagination. The former option, Buhari, incomparably makes the most pragmatic sense as the candidate to vote into office. How can Buhari be Wole Soyinka’s choice? Sometime back Soyinka took Buhari to pieces in a sincere acerbic commentary characterising him as an inhumane repressive military dictator with no prospect of change to offer the Nigerian people http://saharareporters.com/2007/01/14/crimes-buhari-wole-soyinka. I have to ask has Soyinka truly forgiven Buhari for his aforementioned style of military rule? Intellectuals, politicians, advocates and others with a “voice” working in the public domain have the rightful freedom to change their minds on any issues, concepts and controversies as they choose and retain their credibility only as long as their new positions are thoroughly consistent with the ideas that have defined them as deserving of a significant obliging audience. Whatever is happening in the case of Soyinka and his contribution to the growing assurance of Buhari being elected as president of Nigeria is a major enigma, another “moment”. I have heard many people utter a dictum its origins I cannot trace “the worst democracy is better than the best [military] dictatorship”. While this statement is a stark fallacy it captures (a) theraison d’etre of pro-democracy movements and democracy sustainment consciousness, and (b) the intolerance of any kind of dictatorship, especially, of the military kind. One can assume that any supporter of democracy will ignore the fallacy element of the dictum. Soyinka’s pronouncement that no one should vote for Jonathan is not wrong in any realm of thinking. It is democracy as it should be; assess the merits of the candidates contesting in an election and make your choice on whom to vote. The more overt the choice to vote the better, that can even count as transparency. In my article title “Your Vote is not Enough” http://www.xclusive.ie/2015-elections-your-vote-is-not-enough/ I affirm I do not believe that voting in general elections brings about change all by itself. Change in a democracy requires the formation and preponderance of social movements that could put sufficient pressure on democratically elected politicians in order to make them pursue the “public interest” as a core priority. I have always envisioned Wole Soyinka as being the leader and driving force in such social movements. Soyinka did very well for the pro-democracy movement from Diaspora that ended almost two decades of military rule on the ground. However, in the area of the sustaining consciousness of democracy, Soyinka has not really been there. He is an old man now. The enigma of the latest “moment” for Soyinka shows as in the past that he can comfortably work with and support military dictators (in both military and democratic times) he hitherto despised. It takes quite a gift to attain such detachment. So I extend the question. Has Wole Soyinka forgiven Buhari for his military style of rule or is he detached enough to support him? The magical ingredient in the birthing of the “moment” for Soyinka is that he does not actually say “Vote Buhari”, he only says “Do Not Vote Jonathan”. « Wole Soyinka and Military Forgiveness?